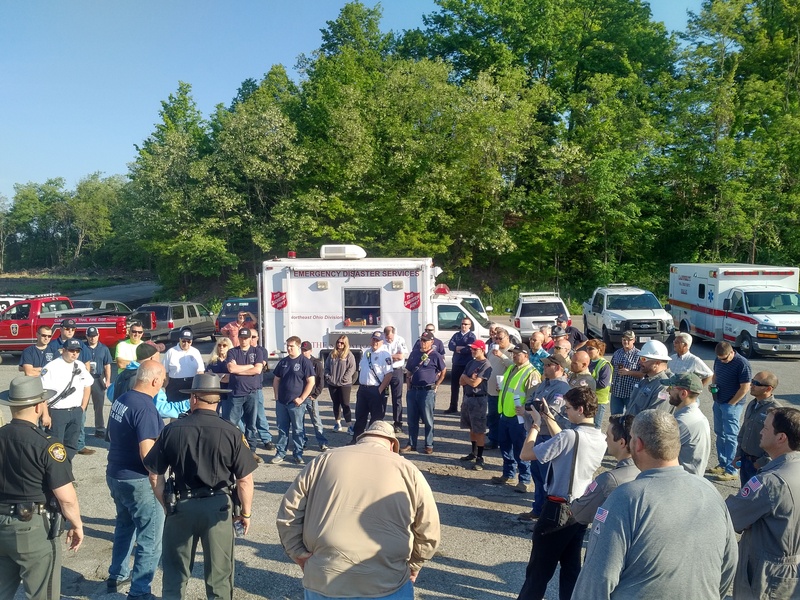 Ascent Resources - Utica, LLC (“Ascent”) in conjunction with Cumberland Trail Fire Department hosted a Local Emergency Planning Committee (LEPC) mock exercise this week. 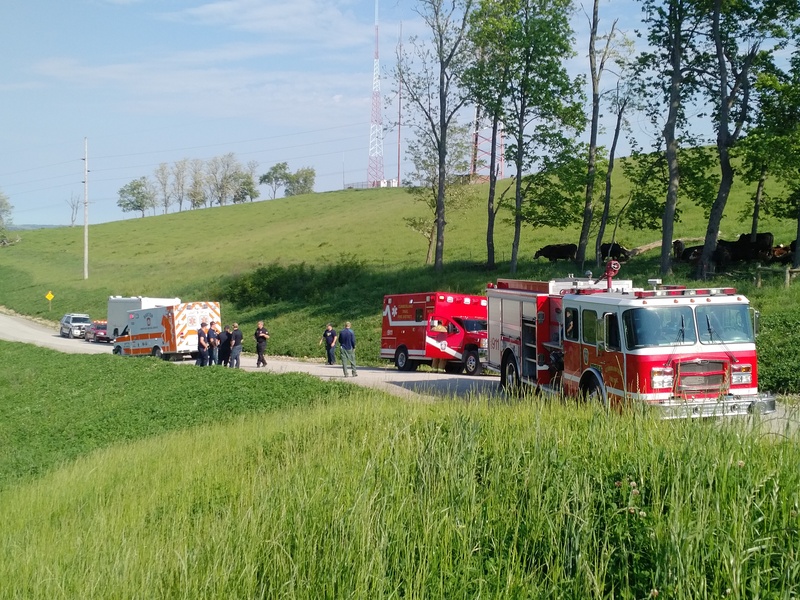 The emergency response training exercise was held in the area of mile marker 215 on Interstate 70 west of St. Clairsville, Ohio. · Ohio Valley Medical Center. A fuel truck (PTL) and produced water truck (Wise) impact each other on the Coleman RCH BL lease road on the hill just off the pad. The water truck driver suffers from a heart attack which causes the incident. This incident will create a chain reaction of accident related events and all parties will be evaluated on the following: (1) notification of response agencies, (2) incident assessment, (3) resource management, (4) communication, and (5) population protective actions as well as other criteria. It appears Ohio mineral owners have had just about enough of the federal and state government interfering with their right to develop minerals located under their private property. At the urging of the National Association of Royalty Owners (NARO) Appalachia and Landowners for Energy Access and Safe Exploration (LEASE), Ohio Republican lawmakers this week added a provision into the state budget to remove the authority granted to Gov. John Kasich to establish the Oil and Gas Leasing Commission and instead shift that authority to the legislature. The action could be a significant step toward ending what has essentially been a six-year fracking moratorium on state lands and parks, and is just the latest win for mineral owners who also emerged victorious following a two-year fight with the Bureau of Land Management (BLM) to gain access to leasing of federal minerals in the state. Similar to the Wayne National Forest (WNF) saga, bureaucratic inaction has led to private landowners adjacent to state lands and parks finding themselves in a positon where their minerals are not able to be fully realized and less desirable to develop. Ohio’s General Assembly actually approved fracking on state lands six year ago, but development has yet to take place. At the time, the legislation essentially laid out a plan toward leasing and development on various state lands using a tiered system where some state-owned lands could be developed with surface disturbance, while other areas would not be accessible. To get the ball rolling, the legislation included a provision to create an Oil and Gas Leasing Commission to govern the process, which required appointments by Gov. Kasich. The Commission establishment and rules were supposed to be in place by June 2012, but that never happened, resulting in what can best be described as a de facto moratorium on state land shale development. In response, mineral owners have taken their private property rights fight to Columbus, where they’ve been working hard to educate legislators in Columbus of their concerns. And as a result of those efforts, the Ohio House Republicans, led by Rep. Andy Thompson, added this week’s provision to the state budget. The measure would essentially turn the clock back six years to when the state initially determined it would allow exploration on state lands. This latest grassroots effort by mineral owns highlights a movement afoot in Ohio where private mineral owners have clearly had enough of anti-fracking groups and political red tape impeding their right to develop private minerals. Fringe environmental activists consistently try to paint these debates as “big oil” fracking public lands for profit, but that’s simply not the case. As we continue to see play out in the Buckeye State, this is actually a property rights matter led by concerned citizens who are standing up for their right to develop their land and minerals. And as EID recently highlighted, leasing federal and state lands can be a major boost to tax revenues and royalties for Ohio. In fact, if we assume the 41,697 acres owned by Ohio Department of Transportation and the Ohio Department of Natural Resources were developed, that acreage alone could mean up to $160 million in bonus payments for the state. This income would surely help add revenue to Ohio’s budget needs. “In areas where development has not been impeded, the impact to local governments and citizens is staggering. People are being pulled out of poverty, new businesses are being created, local governments are upgrading their infrastructure and databases, and jobs are coming back to the area. And as we have already seen through the great example of the Muskinghum Watershed Conservancy District, it’s clear that oil and gas development can be harvested responsibly and in an environmental sound way on public lands, a win-win for the Buckeye State, considering the obvious financial benefits. The U.S. Energy Information Administration released its latest natural gas production findings in late April—showing Ohio and Pennsylvania to be the top two states for growth in natural gas production in 2016. 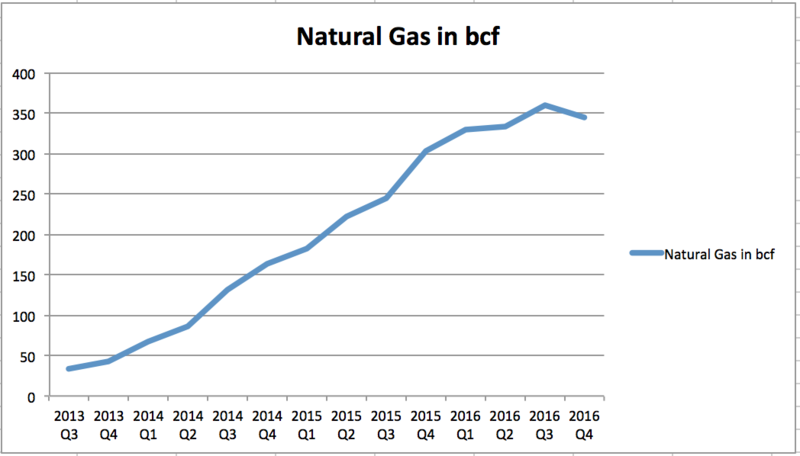 In 2015 the U.S. saw its peak natural gas production at 79 billion cubic feet per day (Bcf/d), with 2016 showing the first annual decline to 77 Bcf/d since 2005. 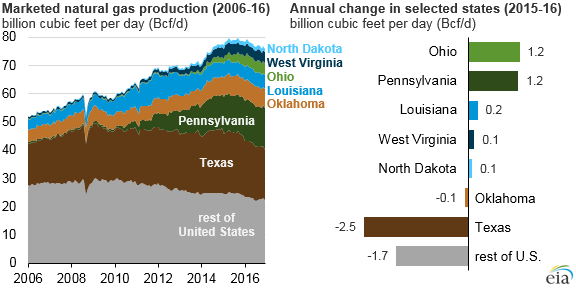 Ohio and Pennsylvania each saw natural gas production increase by 1.2 Bcf/d, with most other fossil fuel rich states seeing minimal increase, while other actually saw declines. Texas natural gas production fell by 2.5 Bcf/d. 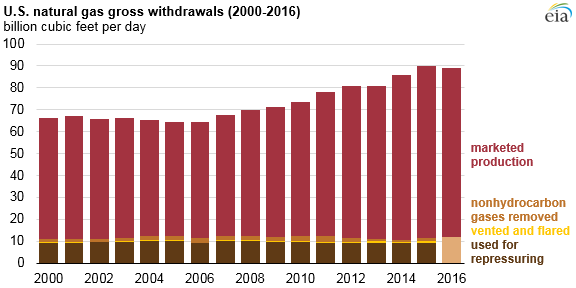 Gross withdrawals are the full volume of compounds extracted at the wellhead, which includes all natural gas plant liquids and nonhydrocarbon gases after oil, lease condensate, and water have been removed. Marketed natural gas production excludes natural gas used for repressuring the well, vented and flared gas, and any nonhydrocarbon gases. Dry natural gas production is marketed production minus natural gas plant liquids. 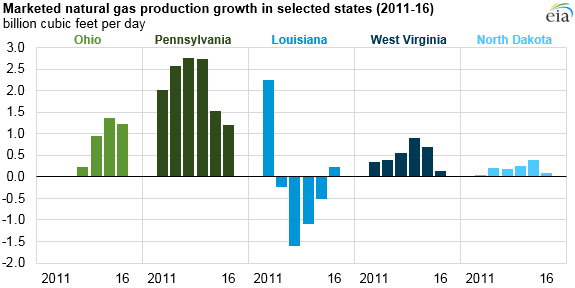 The Utica and Marcellus shale plays which account for 85% of the U.S. shale gas production growth since horizontal drilling really took off in 2012 are a reflection of Ohio and Pennsylvania seeing the two largest increases in natural gas production last year. Over the last decade, the two states were producing less than 2% of the nation’s natural gas in 2006 to 24% in 2016. Ohio surpassed West Virginia in 2016 to become the seventh-highest natural gas producer among U.S. states. Although this information paints a rather positive picture of U.S. natural gas production, especially in our region, the industry is still working its way out of a recession. Specifically in Ohio, in the fourth quarter of 2016 both oil and natural gas production decreased from the previous quarter. We saw oil production start its decline in the beginning of 2016 during the first quarter and has since continued declining—but this is the first time we have seen natural gas production on the decline. While we are encouraged that the industry is making its way back to an upswing, it is important to put production results into perspective in order to get a realistic view of our nation’s oil and natural gas producing industry. Ahead of Earth Day, and as anti-fossil fuel activists prepare to “march for science,” Energy In Depth is releasing a new compendium demonstrating that air quality improvements across the country can be traced directly back to fracking. 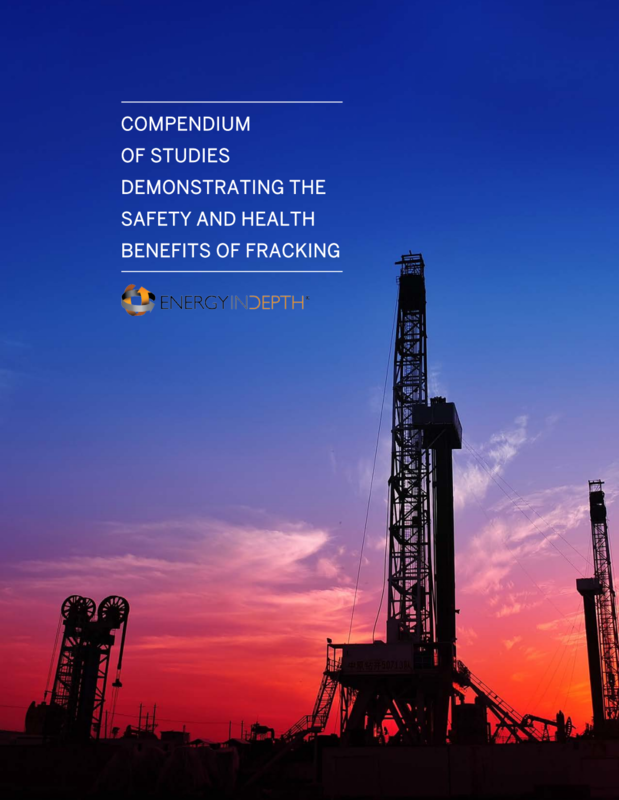 The report – Compendium of Studies Demonstrating the Safety and Health Benefits of Fracking – houses dozens of scientific studies that show how the increased use of natural gas for electricity generation, made possible by the shale revolution, is the reason for dramatic decreases in air pollution across the board. This, in turn, has provided substantial health benefits for Americans. In addition to the compendium, EID unveiled a new microsite, EIDHealth.org – a one-stop shop for anyone looking for information about shale development and public health. Increased natural gas use — thanks to hydraulic fracturing — has led to dramatic declines in air pollution. The United States is the number one oil and gas producer in the world andit has some of the lowest death rates from air pollution. Numerous studies have shown that pollution has plummeted as natural gas production has soared. 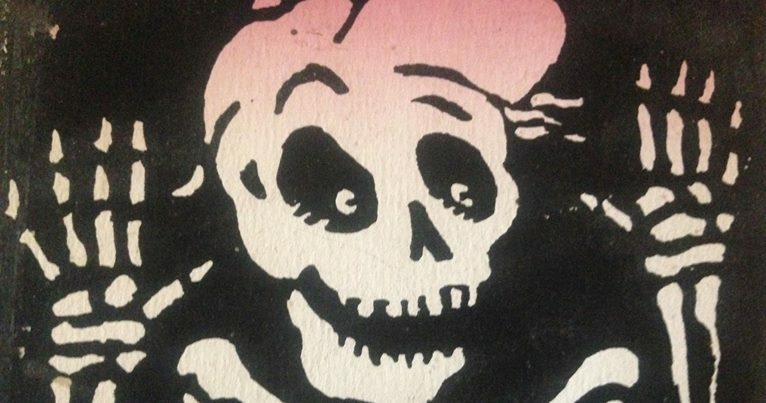 There is no credible evidence that fracking causes cancer. Studies that have measured emissions at fracking sites have found emissions are below the threshold that would be harmful to public health. Fracking is not a credible threat to groundwater. Study after study has shown that there are no widespread, systemic impacts to drinking water form hydraulic fracturing. It is well known that the shale revolution has been a boon to our nation’s economy, its geopolitical position, and the millions of consumers and manufacturers who continue to benefit from historically low energy costs. But the case in support of shale’s salubrious effect on air quality and health continues to be an underreported phenomenon. This new report and microsite puts the health benefits of our increased use of natural gas in the spotlight. The Ohio Oil & Gas Safety Council (OOGSC) is a not-for-profit organization organized by the Ohio Oil & Gas Association (OOGA) in collaboration with the Ohio Oil & Gas Energy Education Program (OOGEEP) and the Ohio Bureau of Workers Compensation (BWC) Division of Safety & Hygiene (DSH). The goal of the OOGSC is to provide quality occupational safety training opportunities and safety resources for these member companies. Our mission is to promote health and safety awareness and environmental stewardship within the oil and natural gas industry in an effort to reduce workplace injuries. To this end, the OOGSC has provided information on the topics of instilling a culture of safety into your company, safety training workshops (via OOGEEP), trench safety, Ohio’s underground damage prevention marking standards and overmarking, fall protection and working at heights, accident analysis, and winter driving tips, to name a few. The OOGSC is also a great way to learn more about industry-related training opportunities. Organizations like the OOGEEP and the Ohio BWC provide several educational opportunities that are beneficial to the Ohio oil and gas industry. The OOGSC will update you on these opportunities in an effort to promote continued industry safety. Membership in the OOGSC is open to the public. Additionally with your membership, employers who pay premiums or administrative fees to the Ohio BWC may be eligible to earn a 2% to 4% rebate on their workers’ compensation premium. 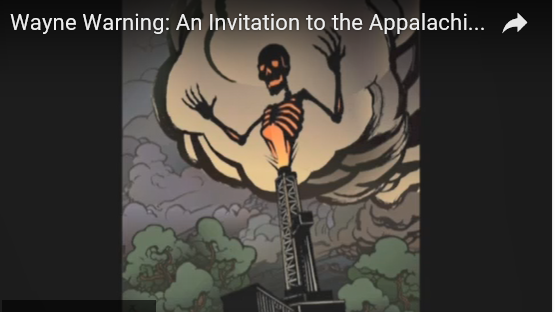 A disturbing anti-fracking video from Appalachia Resist! — perhaps the most rogue fringe activists group in Ohio — was recently posted to social media in an apparent effort to save their failed campaigns. The group, which has been tied to media stunts and several arrests for public disturbance, has shifted focus to use children as part of their misinformation efforts. 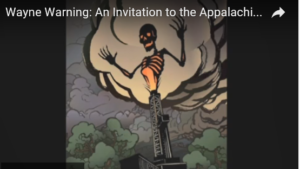 The new video, narrated by a child and an elderly woman, exclaims “fracking kills” and “the danger is especially high for children, babies and nursing mothers,” as well as a host of other absurd claims. 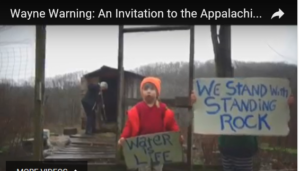 The video also features Appalachia Resist! 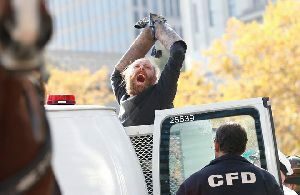 leader Peter Gibbons-Ballew, who was recently charged with civil disobedience, inducing panic, and hindering and failure to comply, after shutting down a busy intersection by chaining himself to a pipe in downtown Columbus. It’s amazing how one day Gibbons-Ballew is putting other children in harm’s way by “inducing panic” in Columbus, yet just a few months later is featured holding a child in this disturbing video. A closer look at this group clearly demonstrates they are completely out of touch with reality and highlights the perpetual “do as I say, not as I do” mentality that has become prevalent among environmental extremists. Two extreme worlds represent this out-of-touch group. On one hand, we have the Appalachia Resist! logo, which represents pretty much everything you need to know about their mode of operation. On the other hand, you have the flip side of the two-faced misinformation campaign, such as this new video moderated by a child. In another scene, we see a man“standing in solidarity,” holding a child as part of their new effort to recruit troops to fight for their cause. This playbook is unfortunately all too common by anti-fracking groups. 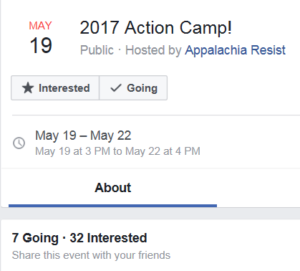 Under the auspice of so-called “solidarity” we hear a child say in this new video—“We’re not just screaming, we’re organizing.” But it appears that enlisting children isn’t exactly helping them organize for their spring action camp, as they have registered a whopping seven people to attend thus far. Of course, we know this effort played out very different in reality, and as the Washington Timesreported, the activist ended up leaving an environmental disaster, including contaminating water at the same sacred grounds they claimed they were protesting to protect. In conclusion, while Appalachia Resist! 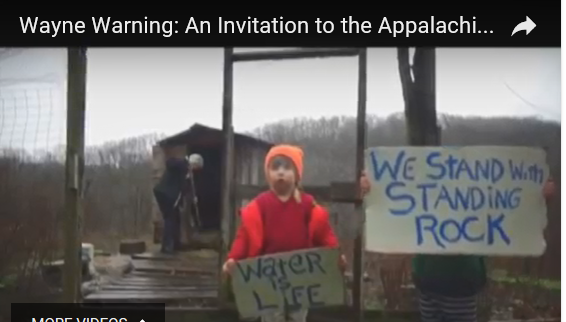 may be using children to advance their agenda to ban fracking, their actions speak louder than words. A history of violence, civil disobedience, resisting arrest and inciting panic are the calling card for this group of fringe environmental activists, which is precisely why they are completely out of touch with Ohioans. The recently released oil and natural gas production numbers from the fourth quarter of 2016 are being reported in varying ways depending on which news outlet is writing the story— we are here to help make sense of it all. Ohio law requires the owner of any capable producing well to annually report its production data to the Ohio Department of Natural Resources (ODNR) Division of Oil and Gas Resources Management. ODNR then release its quarterly report on how much oil and natural gas was produced in our state, from each company, in each county. On March 22 they released horizontal shale production numbers from the fourth quarter of 2016 that show the amounts of oil and natural gas produced from October 1, 2016 through December 31, 2016 (quarter 4, i.e. Q4) completing the results of 2016 activity. In Q4 of 2016 there were 3,577,553 barrels of oil produced and 345bcf of natural gas. The quarter before that we saw higher amounts of both oil and natural gas being produced to the tune of 3,954,095 barrels of oil and 360bcf of natural gas. 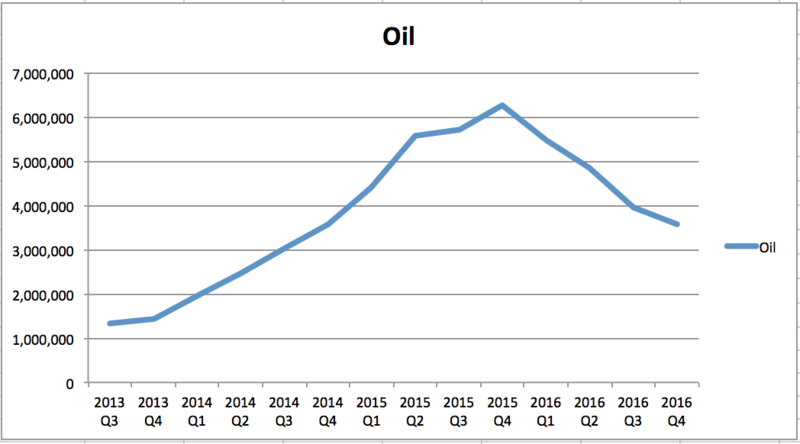 When comparing quarter over quarter you see that the production trend was heading downward by the end of 2016—in both oil and natural gas production. This is the first quarter that both oil and natural gas production decreased from the previous quarter since ODNR began recording shale production numbers. We saw oil production start its decline in the beginning of 2016 during the first quarter and has since continued declining—but this is the first time we have seen natural gas production on the decline. Numerous outlets are touting natural gas production as soaring in 2016—this remains an incomplete representation of the industry as we’ve seen both oil and natural gas production decline. The quarter-by-quarter statistics are the most accurate representation in analyzing a cyclical industry. While we are encouraged that oil and gas producers are able to find efficiencies and continue to drill new wells, it is important that the production results are represented accurately so that the general public gets a realistic view of what is happening across Ohio’s oil and natural gas producing industry. The decline in rig counts, less spending and a smaller backlog of drilled but uncompleted (DUC) wells that persisted as 2016 came to an end are thought to be some of the culprits responsible for Ohio's first sequential shale gas production decline since the state started reporting quarterly three years ago. In today's headlines it's apparent that we need to contact Senator Portman on use of the Congressional Review Act (CRA) for the BLM Venting and Flaring Rule. The GOP’s effort to roll back contentious Obama-era regulations is hitting a snag. Some Republican senators are coming out against a resolution that would repeal an Interior Department regulation governing oil and natural gas drilling on federal land. The rule is designed to cut down on the release of methane, a potent greenhouse gas. Below is a draft letter which we ask you send to Senator Portman. You can click here to easily access the submission page (hosted on Enervest website), which will email Senator Portman’s office directly regarding the issue. For business owners, please share this email with your staff and any others you feel may be affected so they too can contact the Senator. BLM’s Venting and Flaring Rule, which was finalized in the waning days of the Obama Administration, will have an impact on Ohio producers with acreage in the Wayne National Forest Proclamation Boundary. The Venting and Flaring Rule would require producers to install costly emissions control equipment on wells where it may not be economic to do so-which could lead to the premature plugging of wells before the end of their productive life. While we originally believed that the Venting and Flaring Rule would only affect future wells on federal lands, we have learned that is NOT the case and the rule will be applied to previously drilled wells. For those producers who have leases with landowners that may revert to federal mineral ownership at some point in the future, we are of the understanding that those well may be subject to the venting and flaring rule when those minerals revert back to federal ownership. So, while the rule may not affect you now, it may in the future if we do not act. We have an opportunity to get Congress to act to repeal the Venting and Flaring rule using the Congressional Review Act (CRA). The House has passed the CRA to repeal the BLM Venting and Flaring rule, and we need the Senate to do the same. Time is of the essence as it has to be done by March 24. This regulation, released at the eleventh hour by the Obama Administration, will impact adversely the ability of independent oil and natural gas producers to operate on federal lands. While there are many aspects of this rule that are flawed, none is more blatant than the lack of authority the BLM has under the Minerals Leasing Act to regulate methane emissions. Below we have drafted a letter which you should send to Senator Portman. We encourage you to personalize it to reflect how this rule will directly negatively impact you and your business. This must be done before Thursday or we will lose our brief window of opportunity for the Senate to act. You can click here to access the form letter (hosted on Enervest website), which will allow you to easily email Senator Portman’s office directly regarding the issue. As a member of the Ohio oil and natural gas industry, I would like to express my strong support for use of the Congressional Review Act (CRA) to repeal the Bureau of Land Management’s (BLM) Waste Production, Production Subject to Royalties, and Resource Conservation rule (commonly referred to as the BLM methane Venting and Flaring Rule). The Joint Resolution will nullify the Bureau of Land Management (BLM) rule by the same name published in the Federal Register on November 18, 2016. If this rule is not repealed it will have a significant impact on existing and future operations in the Wayne national Forest! Over the course of this rulemaking, our industry consistently outlined concerns that this rule is unnecessary. I believe the BLM ignored substantive information in favor of pushing through an environmental agenda as part of the Obama Administration’s Climate Action Plan. This regulation, released at the eleventh hour by the Obama Administration, will impact adversely the ability of independent oil and natural gas producers to operate on federal lands. While there are many aspects of this rule that are flawed, none is more blatant than the lack of authority the BLM has under the Minerals Leasing Act to regulate methane emissions. Congress delegated that task to the Environmental Protection Agency (EPA) under the Clean Air Act in 1963. As a result, portions of the rule not pertaining to air emissions will not be subject to the CRA’s prohibition on promulgating a substantially similar rule. The economic justification provided by BLM for the rule is outdated, making it inaccurate, and plays heavily into the mantra of monetizing the ‘social cost of methane.’ Cost estimates for the rule come from a 2014 carbon limits study and maintain the assumption that natural gas is currently trading at $4/mcf, which is highly inflated for today’s market. The fugitive emissions program outlined in the rule will result in many marginal wells that produce less than 15 barrels of oil per day or 90 mcf of gas per day to be plugged as the cost of installing and maintaining mandatory measuring equipment is not viable at a low rate of production. This means that states and the federal government will forgo $114 million annually. Reducing methane emissions is in the best interest of every oil and natural gas producer. Producers have every incentive to capture and sell as much of their product as possible to consumers, rather than letting it escape into the atmosphere. However, currently, a lack of infrastructure and gathering lines to collect gas at the wellhead and an extremely slow process to permit pipeline right-of-ways by the BLM make it difficult for producers to safely transport our product to market. Independent producers repeatedly shared our concerns with and provided industry data to the Obama Administration, only to be ignored. Again, as an employee of an independent producer of oil and natural gas, I strongly urge you to support the repeal this unnecessary and costly rule. Rebecca Hammonds, a local organizer and employee of the Ohio Organizing Collaborative (OOC) — the multi-million dollar anti-fracking grassroots organization behind the six-times-failed Youngstown Community Bill of Rights ballot initiatives — was sentenced to 180 days in jail this week after pleading guilty to 13 felony counts for false voter registration and election fraud in January. This is ironic considering this is the same vocal anti oil-and-gas grassroots organization that falsely claimed election fraud after their onslaught of failed Community Bill of Rights efforts in Youngstown just two years ago. Of course, a hand-recount found that, indeed, that the Community Bill of Rights rightly failed. Fast forward two years later, and we learn that one of this group’s organizers has pleaded guilty to multiple felonies and is even guilty of registering deceased people to vote. In fact, these “national foundations” have dumped hundreds of thousands of dollars into their campaign, resulting in the OOC’s coffers to swell by almost a million year-over-year. Yet, according to Hammonds, the OOC was threatening funding cuts, which led to their organizer signing up dead people to vote, apparently. However, OOC failed not once but six times in Youngstown and their fringe so-called “environmental justice” campaigns have been failing all over the state. It appears OOC has become so desperate that it has stooped to unlawful levels to try to advance its anti-fracking cause. The Ohio Oil and Gas Association hosted its 70th annual Winter Meeting in Columbus on March 8th – March 10th which brought together more than 800 attendees including members and top industry leaders from Ohio and the nation to provide the most current updates of the state’s oil and gas industry. There was a more optimistic mood throughout this year’s event as the industry has been experiencing a moderate increase from last year’s downturn. The first day of the event kicked off with what is considered a day of “pre-meeting events,” with OOGA hosting its Executive Committee and Board of Trustees to convene and continue to work towards improving the Association. Evening receptions followed on day one and two that allowed for attendees to network and the Association thank attendees for their support. The next two days held the main events including updates from national authorities, state elected officials, and included production, exploration, legal and legislative industry information. We were excited to host this year’s keynote speaker Robert Bryce, a prominent energy journalist. Bryce covered an array of topics in his address Texas LNG to Kuwait: The Upside-Down, Post-Paris, Post-Trump Global Energy Landscape. While the business session presentations were occurring an industry trade show was simultaneously taking place in the halls of the venue. This year the Association had 80 exhibitor booths displaying products, demonstrating new equipment techniques, and representing multifaceted components of the industry. As attendees came and went and transitioned between business sessions, they engaged with exhibitors showing the latest in oil and gas. And of course this event would not be possible without our sponsors. The OOGA appreciates the support from each and every one of you. We would also like to extend a special thank you to our premier event sponsors Ergon Oil Purchasing, Inc., Ergon Trucking Inc., Dominion East Ohio and American Refining Group. The Association hopes to see each of you back at next year’s annual Winter Meeting and at our Summer Meeting on Aug 7-8 in Zanesville.